Rachel grew up in a small, quiet town full of loud talkers. Her words were always only loud on paper. She has been writing stories and creating characters for as long as she can remember. After living on the west coast for many years she recently moved to Virginia Beach, VA.Escaped is her first Paranormal Romance novel. You can find her over at The Mean Girl Diaries writing non-fiction of the satirical sort. I’ve always been fond of words. As a child I made up stories and tried (very badly) to illustrate them as well. It wasn’t until a few years ago when I was blogging daily that I knew I needed to put what I loved into novel form. Plus, it was the only way to get the characters to stop taking over my mind. A story is the only thing that defies time. I still hang on to every word when my Grandmother tells me stories from her childhood. The stories always posses qualities that seem almost fictional because of how long ago they happened. I hope my life sounds like fiction one day. I always dread this question because I rarely read a book I don’t like…or love. I’ve read the Fever series by Karen Marie Moning multiple times, so that’s high on my list. I also love every book Richelle Mead has written—YA and adult. “Don’t get discouraged.” That is an understatement. Writing a book is the easy part. Editing and all that comes after is where the true show of (strong, durable) character is needed. In your new book; Escaped, can you tell my Book Nerd community a little about it? A place exists like your hometown or like mine that can never be seen or visited unless it lets you. Cadiza is set deep in the Iberian Plateau of Portugal, far away from any civilization and inhabited by residents that are unable and unwilling to leave. Unfortunately, Cadiza is still close enough to large cities to prompt temptation in the young, willful hearts of teenagers. Or at least one, Samantha Scott. She is unlike a normal human as are all the residents there. They are Bruxas—witches. Powerful ones. With her talisman now granted, a golden wrist tattoo giving her the ability to cast and spell at will, Samantha decides it’s time to bust out of Cadiza to fight for a life of her own in the human world. The only hiccup in her plan is that her Bruxa Skill can’t be defined. Some witches have speed, others have the ability to use cathartic magic to control emotions, Samantha has multiple skills which make her dangerous yet valuable to Cadiza and to The Elders. Escaping was never going to be easy but now being on the run from Jade, the Eldest is going to be downright dangerous. Jade will play dirty, even tempting Samantha with her Match—a Bruxa’s one true love to lure her back into her clutches. This proves a confusing triangle completed by Malakai, Samantha's first love and a human intermingled in Cadiza's widespread web of lies. For Samantha Scott the human world proves to be full of deceit and lies leaving her wondering if any choice she makes will be a wise one. With her two best friends in tow, how far is Samantha willing to go to keep her magic and establish a life of her own outside of the Bruxa commune? How far will she go to protect the lives of her friends? To fall in love with whom she chooses? Most importantly, how far will she push the limits to find herself? What part of Malakai did you enjoy writing the most? The characters I create aren’t based on people in my real life, but I do pull their mannerisms from those around me. Funny you ask about Malakai, because a few of his personality quirks are my husbands. When Malakai straightens a stack of books, or answers a question with another question, that’s my loving way of tilting my hat to the main man in my life. For those who are unfamiliar with Samantha, how would you introduce her? 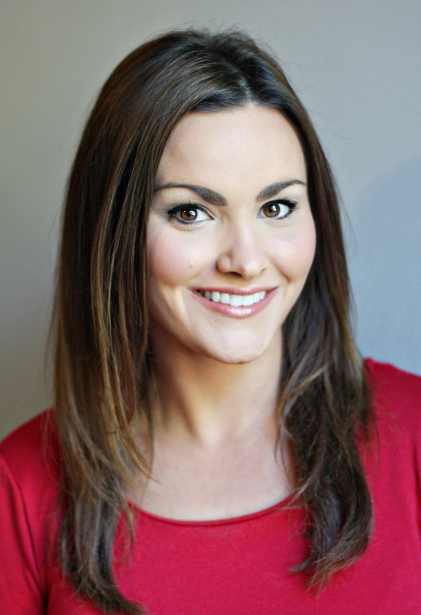 Samantha Scott is a light witch with immeasurable power. She also has a very unique and brash way of interacting with those around her. Her gruffness stems from her need to portray confidence, when inwardly she is questioning everything and everyone. She has this innate desire to trust, but just can’t grant it as easily as she’d like. Sam makes her own decisions, and when she makes them, she sticks by them. It’s a gift and a curse. Embraced, the second book in the Samantha Scott series is scheduled to release August 2013 by Eternal Press. Tying into the question before this, the tag line for Embraced is: Some decisions change everything. And oh my, do they ever. I also just wrapped up the first draft of a New Adult Dystopian Romance. I’m pretty excited about that one as it deviates from Sam and the gang—a refresher of sorts. Can I introduce Xander to a nice, unattached single girl please? I can’t think of any off the top of my head. “How much do you weigh?” I’m a lady, I always subtract five pounds. Sorry, doctor. In my experience, I fall in love with characters, not stories. So develop characters, not stories. The more real your characters seem, the easier it is to tailor a story around them. If you’re really lucky your characters will drive your stories to places you never thought imaginable. As a people pleaser, I’d have to say not loving them back would be more difficult for me to admit to. What's the most memorable job you've ever had? I worked in a video store in high school. You know, back when people actually rented tapes and DVD’s. Crazy, right? I was young and couldn’t believe someone left me there by myself to deal with people. I set off the alarms a few times while trying to leave late at night. The cop would come and shake his head when he saw me sitting out front crying—waiting for him. Again. I was a serial hand-holder way back when. It’s hard for my to pinpoint my very first boyfriend. I’m sure he was very sweet and had sweaty palms. My first real boyfriend in high school was quirky. He had great hair and drew me funny pictures. Far too wet, slimy, and uncomfortable to warrant talking about. I cry a lot. I cried while writing a few scenes in the Dystopian I just finished. It’s odd as I never cry when I reread it, it’s only when I write it for the first time. I’m a fan of weird, slightly morbid movies. Think: The Virgin Suicides. That movie makes me want to live during the 70’s. It just seems a more simple time. Is coffee considered a food? I’m all over the interwebs and I love hearing from readers! Samantha, a light Bruxa has escaped a life that’s all she’s ever known. Now she needs to decide how to keep her precious magic and establish a life of her own in the real world. Trust becomes paramount as she sifts through her past to find the truth. How far will she go to protect the lives of her friends—to fall in love with whom she chooses? Most importantly, how far will she push the limits to find herself? Samantha Scott is a light Bruxa whose powers are more complete than others. Knowing that her powers might be used for evil purposes, she decides to escape the gripping control of the Elder council. Along with her two best friends, she realizes that it is not easy to start life anew. 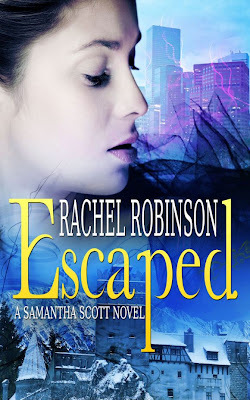 Rachel Robinson’s first book in the Samantha Scott novels, Escaped, is an original and highly compelling story that will take readers on a wild ride alongside the valiant, Samantha Scott. The mystical world the characters live in is vibrantly described in great details through author Rachel’s incredible writing. Readers will be immersed into this world of grand magic and adventure. Lead by a great character, readers will enjoy accompanying Samantha on her escapade. She carries many admirable attributes that she quickly becomes a favorite right from the beginning. Although she is fearless and knows exactly what she wants, she has moments that remind us that she is still human. At times she is confused or lost, but she still has the will and determination to fight back. It is these characteristics that makes her character very attractive and makes the story that much more gripping. It is amazing how great writing can fit so much punch into a short novel. Rachel’s writing etiquette has proven that even a book at 150 pages, it can deliver a story that is well developed and with characters that are full of life and emotions. The plot is amazingly well thought-out and finely executed. The conclusion of the first book will connect the links together while leaving some unchained to set up the sequels. I am certain that with a strong start of this series, I can only imagine how amazing the follow-ups will be. Escaped will make your imagination run wild through its incredible writing and will have your heart-pounding until the very end. Thank you Rachel for making this giveaway possible. 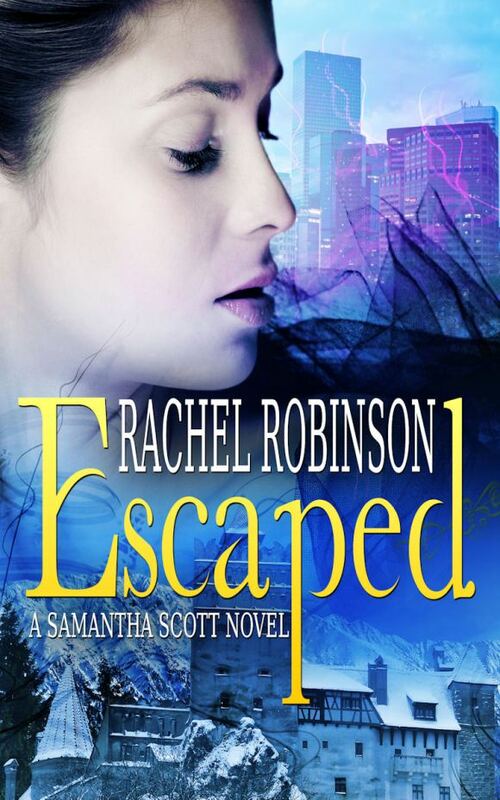 2 Winners will receive a Copy of Escaped: A Samantha Scott Novel by Rachel Robinson. 1 Winner will receive an E-Copy of Escaped: A Samantha Scott Novel by Rachel Robinson. 1 Winner will receive a Kindle Paper White Touch by Rachel Robinson.